As reported in my recent post, I devoted 10 weeks to rebuilding my aerobic base. All of the running was at easy paces. In addition I did a weekly aerobic interval session on the elliptical cross trainer, designed to include a brief period near lactate threshold within each interval to begin developing the capacity to metabolise lactate. Over the 10 weeks I achieved my goal of building up to a weekly training volume of 50 miles including the elliptical session (taking 100Kcal of energy consumption to be equivalent to a mile of running), but was a little disappointed that my legs could only cope with about 30 miles/week of actual running. I achieved a 5% improvement in aerobic capacity over the 10 weeks, which compares favourably with what a younger runner might expect to achieve from 500 miles of easy paced running. However it was far short of the aerobic capacity required to achieve my HM target. I managed to do 12 longish runs (greater than 15Km) but found that I even at a slow pace, these long runs left me exhausted. Ideally I needed a longer period of base-building, but I could no longer ignore the need to begin developing the speed-endurance required to maintain a pace at the upper limit of the aerobic zone for 21 Km. So at the beginning of June I moved from general base-building to race specific training. 3) Two weeks of sharpening/tapering with the focus on maintain speed while allowing full recovery. I have now completed the 7 week transition period. With the introduction of some higher quality sessions, I have cut back total training volume from 50 to 45 miles (equivalent) per week. In light of the need to condition my legs to the demands of running a HM. I have reduced the proportion of the training on the elliptical for 45 to 30 percent, so despite the decrease in total volume I have actually increased the average number of miles run from 28 to 32 miles per week. Each week I performed one moderately intense running session. The moderately intense sessions included downhill stride repetitions; long uphill repetitions; 20x250m intervals at 5K pace; and 4x1Km intervals at 5K pace. I continued to do a weekly aerobic interval session on the elliptical cross trainer as during the base-building period, together with a weekly long run of 15-20Km. In addition, I introduced progressive runs, initially of 8-10Km, in which I aimed to increase pace to a pace near to planned HM pace in the final Km. Beat by beat heart rate recorded during 4x1Km intervals at 5K pace with 600m jog recovery. High beat to beat variability during effort epochs is due to deep respiration. Most of the irregular spikes are artefacts due to poor contact between belt and chest. The spike at the beginning of the 4th repetition is probably a premature atrial contraction. The final 5 minutes of cool down was done on the elliptical cross trainer at a low power output of 30 watts to promote clearance of toxins from muscle. As reported in my post on 17th July describing the running version of the sub-maximal test, there was a substantial improvement in my fitness over the middle weeks of the 7 week block. Heart beats per Km decreased from 726 to 678 at a moderate effort (88% HRmax). In the second week of the block, I did a 4x1Km interval session at 5K pace (4:38 min/Km). Beats/Km averaged across repetitions over the final 30 sec during which HR was stable at 96% max, was 683 b/Km. This matches the estimate of 690 beats/km calculated from the sub-maximal test at around the same time, after correcting for the anticipated decrease in b/Km at 96% HR max compared with 88% HR max. At the end of the block, I repeated the 4x1Km session at a virtually identical effort level. Beats/Km averaged across the final 30secs of each repetition had improved only trivially from 683 to 675 b/Km. However ambient temperature was 26 deg C compared with 16 deg C during the previous interval session. During the warm up, my heart rate had been about 5% higher than anticipated, so even a conservative estimate suggests that at a more moderate ambient temperature, b/Km at 5 K pace would be around 660 b/Km, consistent with the prediction from the most recent sub-maximal test. So overall, it appears that my aerobic fitness increased by around 7% during the 7 week block This compares favourably with the increase of 5% during the 10 week base-building block and is consistent with the expectation that aerobic fitness increases more rapidly during higher intensity training. In the next block of training, the major goal will be increasing speed-endurance: that is, the ability to maintain race pace at the end of a long run. As a preparation for the next phase, in the final week of the transition block, I made the long run gently progressive. I managed to sustain a pace of 5:20 min/Km with a moderate subjective effort of 13/20 for the final Km of a 19 Km run. In light of the serious loss of endurance that I had suffered following the period of arthritis, this was an encouraging beginning of the campaign to introduce HM pace running into long runs. During the next block of training, the key runs will be long runs progressing to target HM pace (4:44 min/Km) for the final few Km. However, despite the encouraging evidence as I move into the second block of race specific training, the target remains daunting. After a series of minor illnesses in recent years, the capricious gods that dictate the health of the elderly smiled on me for a period of eighteen months from mid-2011 to the end of 2012. I remained illness-free and was able to train consistently. By mid-summer in 2012 my aerobic fitness was good, though my pace was generally sluggish. I found it very difficult to sustain a pace of 5 min/Km for even a few Km. Nonetheless, in the final few weeks before the Robin Hood half marathon in September, several sessions of drills and faster running re-awakened some semblance of reasonable speed. I was delighted to run the half marathon in 101:50 (4:50 min/Km). This was 27 seconds slower than I had recorded 5 years previously following my last year of fairly consistent training. That run in 2007 remains my M60 best . Paradoxically, I was pleased to note that in the intervening 5 years from 2007 to 2012, there had been a 20% reduction in distance covered in 5 hops during the hopping test. Although a sign of aging, the evidence of a potentially correctible deterioration suggested that it was plausible that I could set the clock back and improve upon my M60 best in my late 60’s provided I could reverse that deficit. On the other hand, WAVA predicted a slowing of HM time by six and a half minutes from age 61 to 67, so setting the clock back 6 years would be an ambitious goal. In the first phase of my campaign, starting in October 2012, I cut back running to a maintenance level and engaged in systematic weight training which I hoped would reverse the atrophy of my leg muscles. I focussed mainly squats and deadlifts to strengthen my legs and trunk. I made rapid gains in strength and by the early months of this year, I had comfortably exceeded my target. I was able to a set of 5 squats at 170% of my body weight. I intended to do a month or so of lifting of lighter loads at higher speed to increase power in addition to strength, and also some plyometrics, while gradually building up the amount of running. However the capricious gods ceased to smile, and my plan was thwarted by a recurrence of arthritis; especially frustrating as my joints had coped well with the heavy lifting. By the time the arthritis settled, my aerobic fitness had deteriorated markedly, though I was re-assured to find that my strength had declined only slightly. To my surprise and disappointment, my hopping had scarcely improved despite the improved strength. I therefore am facing the possibility that the cardinal factor in my loss of speed is loss of elasticity of my connective tissues, rather than muscle strength. My range of motion during static stretches has deteriorated only marginally in the past 50 years. The loss appears to be a loss of elastic recoil. I am not sure to what extent this can be recovered in old age, though a program of gentle plyometrics would probably be the best strategy. However, even gentle plyometrics was out of the question in the ealry months of 2013 in light of the recent arthritis. So my ambitious goal to set the clock back six years seemed ill-starred. Nonetheless, I was not prepared to give up lightly, so I formulated a tentative program: 10 weeks of base-building founded on a moderate volume of slow running together with cross-training on the elliptical cross trainer to minimise stress on my joints, followed by a period of specific preparation for a HM in September. I am now six weeks into the specific HM preparation, so it is a good time to evaluate progress. As Arthur Lydiard demonstrated with spectacular success fifty years ago, the key to base building is a large volume (100 miles per week or more) of predominantly fairly easy paced running. Lydiard described training sessions as quarter, half and three quarter paced effort. The crucial feature of ¼ effort was that at the end of the session you could repeat it again without appreciable stress. Although it appears that Lydiard himself never quantified training effort in relation to lactate threshold, it is clear that his ¼ paced efforts were well below lactate threshold, while ¾ effort sessions were run near to lactate threshold. During base building the majority of the training volume is at ¼ effort but on Sunday mornings Lydiard’s protégés usually did a more effortful long run in the Waitakere hills near Auckland. Anecdotal reports by visiting elite athletes imply that this run was quite challenging. Lydiard also recommended wind sprints during base-building to maintain fluency of the running action. In light of the principles established by Lydiard and subsequently quantified more precisely by Hadd, I decided that the key component of my base-building program would be easy paced running at around 75% of HR max. However, I faced a serious challenge in adapting the program to fit my circumstances. Despite being untroubled by illness in 2012, I had found it very difficult to increase training volume above 40 miles per week. I had on a few occasions increased to around 50 miles per week, but subsequently experienced profound exhaustion that lasted for several weeks. In the 18 weeks of base-building in spring and summer I had averaged barely 40 miles per week. In view of my lower level of fitness at the start of base-building this year, it was clear that if I was to have any chance of achieving my ambitious goal, I needed to aim for a weekly volume during base-building that was higher than I was able to maintain in 2012. Therefore I made three major adaptations to a typical Lydiard/Hadd base building program. First, I decided to sacrifice the speedier components the programs of Lydiard and Hadd. My joints felt too fragile for Lydiard’s wind sprints, while including anything resembling the Waitakere hill run, or Hadd’s two ‘work’ sessions each week would almost certainly prevent me achieving a weekly volume of even 40 miles per week. So planning running pace was simple. The majority of my runs would be short or medium length ( 8-10Km) at an easy pace – typically with heart rate near to 75% of maximum. A weekly longish run was clearly essential, but at the beginning of the program I found that my endurance had deteriorated even more markedly than my aerobic capacity. It was clear that I would have to do the longish run at whatever easy pace I could manage. Secondly, I decided that I would augment the volume of running by adding several sessions on the elliptical cross trainer each week. The elliptical utilises similar muscles to running but avoids the damaging eccentric contraction experienced at footfall. I set a target for total training volume equivalent to 50 miles of running per week, calculated on the assumption that consuming 100Kcal of energy on the elliptical is approximately equivalent to running 1 mile. While I hoped to do no more than about 20% of the total training volume on the elliptical, I was prepared to adjust the proportion of elliptical cross- training as required to avoid the accumulation of damage to my joints and muscles. Thirdly, in light of the fact that both Lydiard and Hadd recommend a minor but regular amount of running near lactate threshold during base building, I decided that one of the weekly elliptical session would be designed to get me near to lactate threshold. Because I find interval sessions of the elliptical are much more interesting than long sessions at a steady rate, I have developed various aerobic interval sessions. In these sessions I push vigorously for a short period to the level where a small amount of acid has accumulated and then allow a recovery sufficient to dissipate the acid, thereby avoiding bathing my muscle fibres in acid for sustained periods. For example, I do 25 repetitions of one minute at a work load which would get me above lactate threshold if I were to sustain it for several minutes, alternating with one minute of easy recovery pace during which heart rate falls back below 70% of maximum. Even after 25 repetitions, there is minimal upwards drift of peak HR during each effort epoch, suggesting minimal accumulation of stress. This session is modelled on the 200/200 fartlek session which Hadd recommended during base-building. After a slow build up of training load on the elliptical as the arthritis resolved, I was ready to start systemic base-building in mid-March. I was unsure how long a period of base-building would be required because I did not know how quickly my fitness would return. However, last year, I had not left enough time for race specific preparation before the HM. If I was to reserve adequate time for race specific preparation this year, I could afford little more than 10 weeks of base-building. Over the five weeks from late March to the end of April this year, I steadily built up training load to my target of 50 miles (equivalent) per week. By that time, I had managed to cut the proportion of my training on the elliptical to about 40% of the total. In the subsequent five weeks I did at least 50 miles (equivalent) each week, without accumulating exhaustion or aching joints. By the end of May I had achieved a total of 502 miles (equivalent) in the 10 weeks since the beginning of regular base-building. 55% of this training had been running – a slightly lower proportion than I had hoped for, but I think that reverting to the elliptical whenever my connective tissues were starting to complain too much, made it possible for me to meet my target training volume. In the 10 weeks, I had done 12 long runs (greater than 15Km) and 18 aerobic interval sessions on the elliptical. Testing using the elliptical version of the sub-maximal test described in my post of 25th June demonstrated that my aerobic fitness had improved by about 5% over the 10 weeks. Fig 1 shows aerobic capapcity duirng the three levels of the sub-maximal test, presented in the form of heart beats per watt-hour. The data is the same as that depicted in figure 3 of my post on 25th June describing the elliptical sub-maximal test, but this form of presentation matches the form of presentation that is most convenient for comparison with the running version of the test described in my post on 17th July. For a person of my weight, 40 beats/watt-hour is roughly equivalent to 700 beats per Km when running, though this conversion is only a crude approximation based on the assumption that the metabolic efficiency of concentric muscle contraction is 25%. Figure 1: the improvement in aerobic capacity produced by 10 weeks of base-building. Aerobic capacity is represented by the number of heart beats required to generate an output of one watt-hour on the elliptical cross trainer, at each of the three work rates employed in the sub-maximal test. For purposes of a crude comparison with running, 40 beats/watt-hour is roughly equivalent to 700 beats per Km when running. The average improvement across the three levels was 5%. The encouraging conclusion is that I had achieved approximately half as much percentage improvement over 10 weeks at a volume of 50 miles (equivalent) per week as Hadd’s much younger protégé, Joe, had achieved during 16 weeks of base-building at a volume of around 80 miles per week. Thus, I derived slightly more percentage benefit per mile of running than Joe, though a little less benefit per hour of training, on account of my much slower pace. The other encouraging thing was that my body had coped well. Although at times I had felt tired and my connective tissues had been a bit achy, my joints no longer felt fragile. On the other hand, it was disconcerting to note that that my aerobic fitness was still far short of what I had achieved last year and I was finding it very difficult to run any faster than 6:15 min/Km pace during long runs. My endurance was very poor, probably as a consequence of only a modest total volume of running. Typically, I was feeling very tired after about 19Km. Ideally, I required a longer period of base-building. I regard progressive long runs reaching a pace near to race pace in the final few Km as the key session in HM preparation. Last year, in my race specific preparation I did not manage to include even short periods of race-paced running in any of my long runs during training. This year, I am determined to achieve at least three such progressive long runs before the target race in September. So by the beginning of June, it was time to make the transition from base-building to race specific training. In particular, this would entail some faster running, starting with aerobic interval sessions together with a weekly progressive run, initially of only 10 Km but subsequently increasing the distance. I am now six weeks into that program and am beginning to see some evidence of benefit, but I will reserve the description of that for my next post. The art of effective training is maintaining a training load sufficient to produce steady improvement while avoiding the damaging effects of over-training. In my preceding post, I described a test designed to help achieve these goals by assessing improvement in aerobic fitness while providing a sensitive indication of the early signs of over-training. The first key principle in the design of the test was measurement of heart rate (HR) and heart rate variability (HRV) under various circumstances, thereby assessing multiple aspects the way that the autonomic nervous system regulates the heart, and avoiding dependency on a single potentially erratic measurement. The second design principle was that the test should fit within the framework of a warm-up preceding training, making it practical to perform it frequently within only minor interference with a training program. At the time I was doing much of my training on the elliptical cross trainer so I designed the first version of the test for use on the elliptical. The protocol started with measurement of HR and HRV while standing in a relaxed state. Then after very brief warm-up to allow initial stabilization of the cardio-vascular system, HR was measured at three different levels of work intensity: easy, mild and moderate; followed by an assessment of heart rate recovery (HRR) during a minute of standing and finally HR was assessed again in the final minute of a short easy-paced recovery. The evidence accumulated during a 10 week period of aerobic base-building indicated that the first version of the test provide a sensitive measure of improved aerobic fitness, while also quantifying stress levels during a period when life-events were challenging, and in addtion it proved also to be a sensitive indicator of impending over-training. More recently I have developed a version of the test for use while running. The structure of the test is similar, but the biggest practical challenge to overcome was that fact that it is less easy to maintain a constant work rate over a period of several minutes when running compared with exercising on an elliptical cross-trainer with a power meter that allows regular monitoring of work-rate. The key thing that provides the solution to this problem is the observation that the number of heart beats per Km changes only slowly with changing effort across the aerobic range. Therefore, absolute stability of pace is not essential if the measurement of interest is heart beats per Km at each work-level. Furthermore, it is not essential to achieve the same pace at each of the three work levels on different occasions. Small discrepancies in pace from session to session have a minimal effect on the measured beats per Km at each level, and larger discrepancies can easily be dealt with by simple correction. I do not have access to a track, so I developed the test on a 230m loop of woodland path – slightly undulating and laced with treacherous tree roots, but on the other hand, an inspiring environment in which to run. At each of the three work-rates, I do three laps at approximately constant pace. During the first two laps, HR stabilises. Heart rate in the final lap at each level is used to estimate beats/Km at that level. The final lap should cover the same terrain on each occasion, and preferably should be a closed loop so that variations in wind speed from day to day have little effect. If you have access to a track, 2×400 m would probably work as well. The first 400 m lap allows stabilization. Beats/Km in the second lap is the measurement of interest. 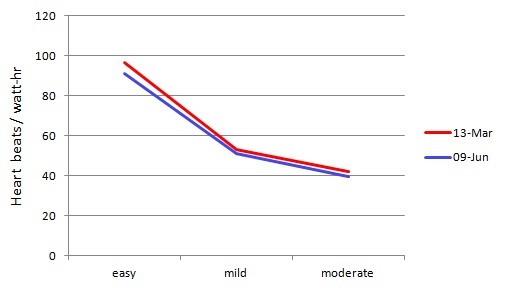 The easy, mild and moderate work levels correspond to 75%, 82% and 88% of maximum heart rate. The highest level (88%) is near the top of the aerobic range. The subjective effort required to maintain this pace increases quite markedly when over-training occurs, so for the purpose of early identification of over-training, it is desirable to have a level as high as this, though 3-4 minutes at this pace is perhaps a little more demanding than an ideal warm-up. Perhaps this level could be omitted on days when you want to perform the test before a demanding training session, though I find the full version of the test works well as a warm up for moderately intense interval sessions. The HR measured during the final lap of the recovery (performed at a subjective effort similar to that of the easy first phase of the test) reveals a substantial increase in beats/Km at that effort, demonstrating substantial mobilization of adrenaline during the test. At least on irregular course, it is more practical to aim for a particular HR than a particular pace, though it is necessary to allow for the fact that it takes a few minutes to reach a near equilibrium state. If you have a foot pod that provides a continuos display of pace, using it to maintain a constant pace might be preferable. Nonetheless, I find that at least at mild and moderate effort levels I can maintain pace such that time per lap is constant to within less than 2% without using the foot pod. Figure 1 shows the time course of heart rate during the full test. Figure 1: The tine course of beat by beat variation in heart rate during the sub-maximal test. The black event markers mark the end of each lap. The horizontal bars beneath the R-R trace for the final lap at each intensity level indicate the time period over which average HR is calculated to provide an estimate of beats/Km at each of the three intensity levels. 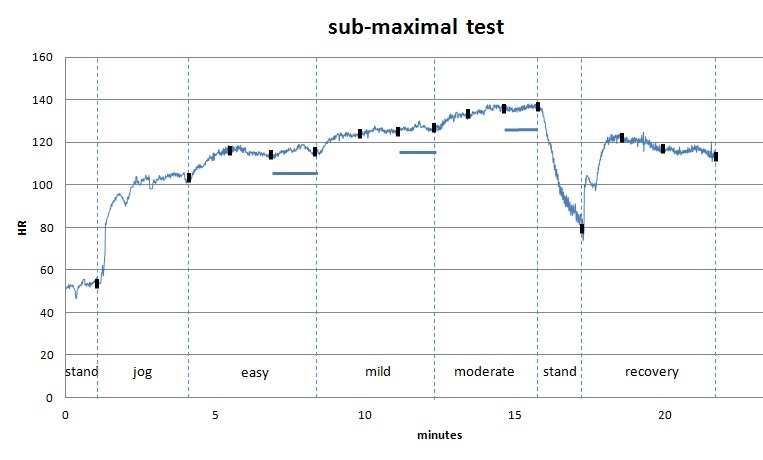 Figure 2 shows the beats/Km in the final lap at each of the three effort levels on tests performed prior to an interval session in three consecutive weeks of my current phase of training, in which I have introduced interval training after a phase of low intensity, moderately high volume base-building. On all three occasions, subjective effort during the final lap at the third level was either 11 or 12/20. During this time I have not experienced over-training, though past experience indicates that effort level would rise to 14 or 15/20 at this pace during the early phase of over-training. 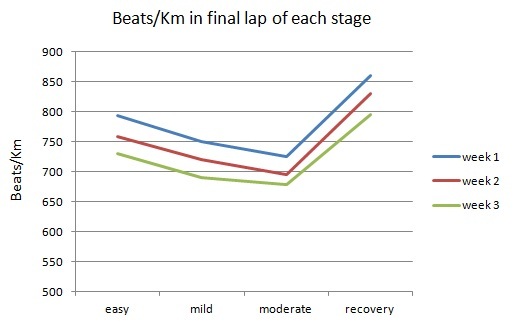 Figure 2: beats/Km at each of the three test levels and during the final lap of the easy recovery run, recorded on three consecutive weeks during which a marked improvement in fitness was observed. The amount of improvement over the three weeks is surprising, though it did correspond to a marked improvement in my fitness observed during other sessions in the same weeks. I will describe my current training program in greater detail in a subsequent post. Note that beats/Km decreases gradually as effort level increases. From the slope of the line a correction factor can be estimated if the intensity at any of the levels on a particular occasion is appreciable different from the intended level. The other measurements of interest (standing HR and high frequency HRV during standing at the beginning , and heart rate recovery while standing for one minute after the final lap at the highest intensity level) are performed as in the elliptical version of the test described previously. Interestingly, in the three weeks depicted in figure 2, initial standing HR was 52, 57 and 52 beats/min while the three values of RMSSD (a measure of high frequency HRV that reflects ‘restful’ parasympathetic activity) were 51, 30 and 57 milliseconds. Thus both standing HR and high frequency HRV indicated reduced parasympathetic activity in the second week, possibly indicative of a somewhat increased stress level. In general, high standing HR and low high frequency HRV provide a sensitive indication of general level of stress. But neither standing HR nor HRV provide a consistent and sensitive measurement of improved fitness because they are too sensitive to various sources of stress. The interpretation of HRR is complex, though the earliest phase (in the first 30-40 sec) is largely determined by the ability to re-engage the parasympathetic system, which is a good indicator of healthy cardiac regulation. One feature I attend to closely is the development of strong beat to beat variation within 45 sec of stopping running (illustrated as the fuzziness of the trace in figure 1) confirming strong parasympathetic re-engagement. Although I have not experienced an instance of over-training since I began the development of the running version of the test, the preliminary evidence acquired with the elliptical version revealed low HRR during over-training. Furthermore, during the over-trained state, HRR was low despite moderately large high frequency HRV during the initial period of relaxed standing, suggesting that high initial parasympathetic activity but reduced ability to re-engage the parasympathetic system might be a marker for over-training, but this is only a tentative interpretation. You are currently browsing the Canute's Efficient Running Site blog archives for July, 2013.